What gauge to start stretching your ears at? A great question that you will need to know when starting to stretch your ears is what size should your first stretch be. For the majority of people, 14 gauge is a good starting point if you have only worn regular earrings. 14 gauge is a good starting point if you never wear earrings or if you have recently had them pierced and they are just healed up. If you are certain that you want to stretch to a larger size, you can also have your ears pierced at a larger gauge(such as a 10 gauge or 8 gauge). This will save you some money on jewelry from stretching all the way to that size. The healing time will be a bit longer but it is perfectly healthy as long as you follow proper aftercare guidelines. What size can I stretch up to without permanent damage? There are a lot of different opinions on this topic, but the majority of professionals in the body modification industry recommend never going any larger than 2 – 0 gauge if you want your ears to totally close up where you can’t see through them. Keep in mind though that everyone’s anatomy is different, but the majority of people will be able to take their plugs out at 2 -0 gauge and your lobes will look normal after a 2 – 3 months of closing up. There are also other factors that will affect the permanency of your size. One of the biggest factors is if you have stretched too fast and skipped sizes. When you skip sizes and stretch too fast then it actually will do more ripping of your skin than actual stretching, so this can make your holes much larger and more permanent in the long run. To optimize your chances of having normal looking lobes if you decide to take them out, then you will want to make sure not to skip sizes and wait at least a full month between each stretch. If you have stretched to a really large size and decide that it is not for you, then there is always the option of surgery. Lobe reversal has become pretty popular these days so that is always an option to consider if you have stretched really large and want your lobes to look like the average person’s. How long should I wait between each stretch? Many people make the mistake of stretching too fast which can cause some long term damage to your lobes. I recommend waiting at least a full month between each stretch. A full month is generally enough to give your last stretch time to heal, and also to help your lobes loosen up a bit for the next stretch. The slower you go, the nicer your lobes will be in the long run though, so waiting even longer than a month is highly recommended. Even though the temptation is hard to resist sometimes when you are ready to stretch, it’s always best to give it some time, you will thank yourself in the long run. NEVER use the acrylic tapers you can buy in the mall!!! Acrylic can not be sterilized and are not smooth. The jagged edges will cut your ears and they harbor bacteria. Go to a professional! If you come to me at my body piercing and jewelry studio in Arlington, Va, to stretch your ears, I will only charge you for the jewelry or a nominal fee if you have your own jewelry. NOTE: I will only use jewelry that you have previously purchased somewhere else if I can determine the material and I am sure it is of the appropriate size and style for your body. Will stretching too fast and skipping sizes damage my ears? Stretching your ears too fast and skipping sizes is a common problem that can do some serious damage to your piercings. When you skip sizes and stretch too fast you really are doing more ripping of your skin than actual stretching. Human skin only has a certain elasticity so going too big and too fast is enough to cause ripping and tearing of your skin. It’s highly recommended to wait at least a full month between each stretch and to never skip sizes so your ears will have minimal chances for long term problems. Also the slower you go, the thicker and healthier your ears will be in the long run (which is really important if you plan on going to a large size). What is a blowout and how to fix it? Blowouts are another common problem that is generally caused by stretching too fast or skipping sizes. The way this problem occurs is when the fistula (inside of your piercing) is actually forced out through the back of the piercing. A blowout is a small flap of skin that will hang over the edge of your plugs. Though it is not generally too noticeable if it occurs on the back of your ears, it can limit the type of plugs you wear and you will generally need to wear plugs with a bigger wearable area (to allow room for the blowout). If you skip sizes or go to fast on a blowout that has already occurred then it will often continue to get bigger and bigger. The best way to help get rid of a blowout is to take your plugs out immediately after you notice it and downsize 2-3 sizes smaller so your piercing will start to heal itself. Though it is never 100% guaranteed that it will go away, the chances are pretty good of it going back to normal if you downsize immediately after it happens. If you leave the blowout to heal up without downsizing though, then it will generally heal up for good that way and become permanent. There are many ways people have tried getting rid of healed blowouts, but the most common way is to downsize and to use oils like jojoba to help moisturize and soften up your skin. There is also the option of getting it surgically removed which is highly recommended if you have the funds to do so. Ear funk, the causes and how to fix it? Once your ears start to get stretched, a common problem that everyone has is the issue of “ear funk”. Ear funk is essentially the dead skin cells of the inside of your ears being trapped in the inside of your fistula (the skin inside of your piercing). Most of the dust in your own home is actually from dead skin cells that shed off of your body, ear funk is from the same thing. When you wear plugs for several days, the dead skin cells start to build up on your jewelry and when you remove the plugs they can be super gross. The way to get rid of this issue is either to wash out your ears daily in the shower or to just wear organic plugs. Organic plugs are porous so they soak up all of that ear funk and keep your ears dry and smelling fresh. 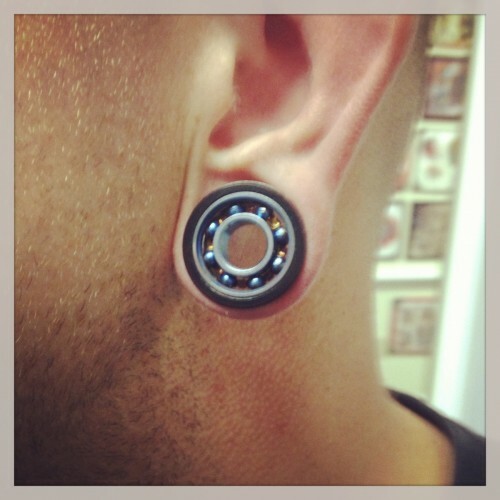 Many people have the problem of not being able to fit in their double flare plugs if they have never worn them before. A double flared plug is a plug that has flares on both ends (the flares are actually slightly larger than the actual center). Double flare plugs are totally fine to wear but they can sometimes be hard to get in (especially on sizes under 0 gauge). There are several tips on getting them in that will make it much easier. The 1st thing to help with getting them in is to use lubrication. Any water based lubricant will help to get them in and out easily. Also you will want to insert them at an angle. If you try to force them through straight into your ears then it will be much harder for them to fit through. Inserting them at a slight angle gives them enough leverage to pop through. On sizes under 0 gauge however, they will often require you to stretch slightly larger to be able to fit them through. The larger you stretch, the easier double flares will be able to get in, so the smaller sizes are a lot harder to get through. If you are trying to fit a set of double flares in that are under 0 gauge then it’s good to try doing a little tape wrapping (see info on the tape wrapping method above) to help loosen up your ears a bit and get the plugs in. Jojoba oil is an all-around great product. Its best uses are to soften skin, reduce scar tissue, thicken lobes, and to moisturize. By massaging jojoba oil daily on your lobes, it helps to thicken them up over time and to keep them healthy. It also helps to reduce the size of blowouts over time if massaged daily. Jojoba is great for organic jewelry as well, by using it to moisturize your wood or buffalo horn/bone plugs, it helps to keep them protected for long term use. Organic plugs are pieces that are made from a living thing such as wood, buffalo horn & bone, coral, shell, etc. Organics generally don’t require much more maintenance then the average set of plugs though. Materials such as wood will expand and contract as they get wet though so to avoid cracks and swelling, it’s for sure best to keep them as dry as possible. If you are purchasing a set of organic plugs that isn’t super expensive, then just wear them and don’t worry about if they wet or not. But if you have a nice set that you want to keep for years then it’s highly recommended to keep them as dry as possible. Also organic pieces that have inlays or where multiple materials are used (such as multiple inlayed woods), then you for sure want to keep them dry to avoid breakage or cracking. It’s also really good to use jojoba oil on organic jewelry to keep the pieces looking fresh and polished. All you need to do is take a small drop onto your fingers and rub the jojoba oil into the plugs and they will look like a fresh new pair.